Wednesdays, Thursdays and Saturdays from beginning of May to end of August 2019, with private tours taken at any time of the year. 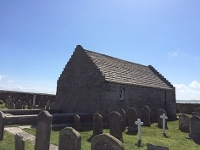 Join us for a wonderful journey through the archaeological and natural heritage of Papay. On arrival by boat - or perhaps on the world's shortest scheduled flight - you will be met for your guided tour of this enchanting island. The morning will include a short walk to the early Neolithic farmstead at the Knap of Howar. These two linked dwellings are over 5000 years old, making them the oldest standing houses in Europe. We'll also visit St Boniface Kirk (a beautifully-restored twelfth century church on the site of an earlier Celtic chapel) and the impressive steading of Holland Farm (where fascinating buildings from the past 400 years intermingle with those of today's vibrant farm). Papay is renowned for the warmth of its welcome and the quality of its food. We'll break for a delicious three course lunch at the Kelp Store Craft & Heritage Centre. In the afternoon we'll walk the RSPB North Hill reserve, to see some of Papay's wildlife highlights. 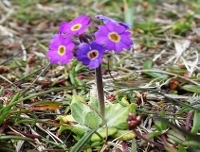 The maritime heath abounds with flowers such as Primula scotica. Up to the end of July, the cliffs of Fowl Craig are home to nesting Puffins. The Arctic and Great Skuas will keep you watching the sky throughout the season. We will also take a moment to remember the extinct Great Auk - the last British breeding pair was killed here some 200 years ago. A very special day is brought to an end with tea, coffee and home-bakes. Email papayranger@gmail.com to book, or leave a message at 0793 1235213 or visit the Papay Ranger facebook page. Tours can be specially arranged throughout the year - contact the Ranger to discuss what is possible. These tours can be tailored to particular interests, perhaps taking in some of the more remote and rugged parts of the island, or spending more time at particular sites. However, the itinerary for the Papay Peedie Tour takes some beating! For years, this tiny island off Papay's east coast has been a much sought after destination for visitors. However, until recently only a lucky few got across to be delighted by the wildlife and archaeology. Now, thanks to Papay Development Trust's new boat, the Holm's Neolithic South Cairn (with its impressive 67ft long subterranean passage with carved decorations and 14 chambers) can be enjoyed by visitors when the weather conditions are suitable. The boat trips are dependent on weather. Email papayranger@gmail.com to book, or leave a message at 0793 1235213 or visit the Papay Ranger facebook page. Prices include provision of helmets. 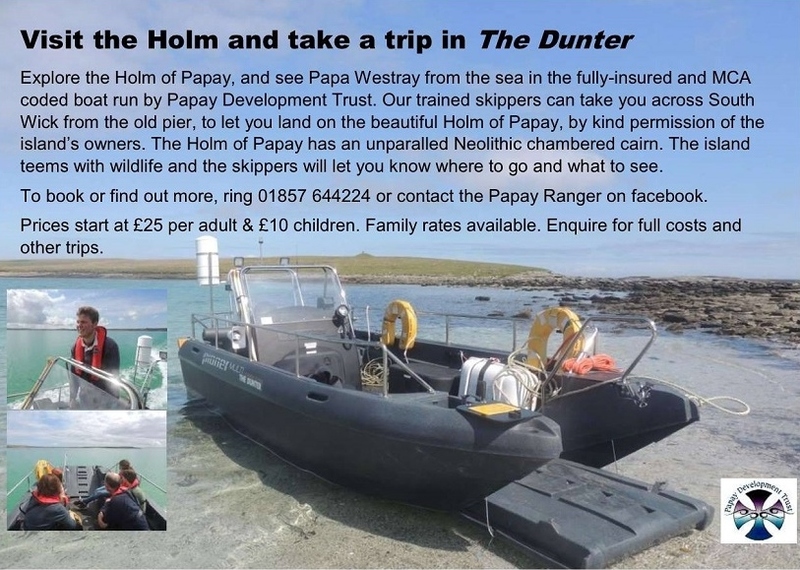 Email papayranger@gmail.com to book, or leave a message at 0793 1235213 or visit the Papay Ranger facebook page. Puffins, skuas, Arctic Terns and much more can be seen on the RSPB North Hill nature reserve. Guided tours are given by the RSPB warden on Wednesdays and Saturdays from early May to the end of August. To book, contact the Orkney RSPB office on 01856 850176.